Calling all High School Students! Join us for a night of MVP fun as we host a premier panel of Sports & Entertainment experts. You'll get to ask questions and find out what it's really like to work with the St. Louis Cardinals, the Blues, The Pageant and the St. Louis Sports Commission. The first 50 students will receive 2 Cardinals Ticket vouchers with valid high school ID. 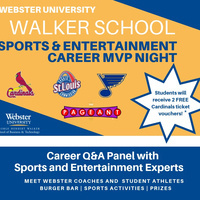 Come enjoy a Burger Bar and meet Webster Coaches and Student Athletes while you learn about careers in sports or entertainment!